Everything you need to astound your hound. The Tasty Pack contains three deliciously exciting products that have been designed to meet the teething and play needs of puppies and small dogs. 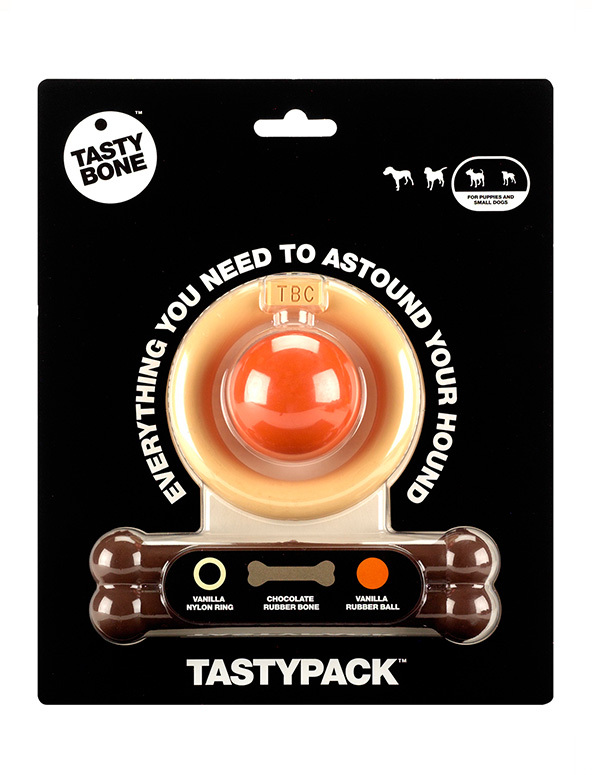 The TastyBone, TastyBall and TastyRing will provide hours of fun and enjoyment for you and your dog, all packed with long-lasting, irresistible flavours. The rubber Tastybone and TastyBall will bounce energetically, encouraging your dog to play and have fun, while the super strong nylon TastyRing will satisfy every bit of your dog's urge to gnaw. This Tasty Pack includes a lip-smackingly delicious Vanilla nylon ring, Chocolate rubber Tastybone and Vanilla rubber TastyBall and is designed for puppies and small dogs. The rubber TastyBone and TastyBall are interactive play toys and are suitable for gentle chewing. Do not throw the Nylon TastyRing for your dog to catch, the impact could damage their teeth. All breeds of dog are different, please choose a product larger than your dog’s mouth. As a dog chews the bone, small rice sized pieces will naturally shave off, these pieces are safe for your dog to ingest and will pass though their system without causing harm. Dogs should be supervised with all TastyBone products, once the bone becomes smaller than your dog’s mouth it should be removed immediately and disposed of. It is the responsibility of the dog owner to ensure that this product is suitable for their dog, all dogs vary in size and chew strength.